Clodius Albinus, the Roman Governor of Britain and Deputy Emperor, has proclaimed himself Emperor of Rome at York. He is taking most of the British Roman army into Europe in a bid to take over the empire. It is hoped that the Maetae, an alliance of native tribes living in the land between the two Roman Walls, will maintain peace during the absence of the frontier troops. The Maetae tribe has crossed to the south of Hadrian's Wall to cause major problems for the Romans. Meanwhile Clodius Albinus has committed suicide after his defeat by the Roman Emperor Septimius Severus on the continent. Four temples to Mithras exist on Hadrian's Wall. Mithraic worship is the most popular religion in the Hadrian's Wall area. Roman Governor Alfenus Senicio has ordered extensive rebuilding and repair work following the heavy damage suffered during the disturbances of recent years. Following years of revolt, the Roman Emperor Septimius Severus has heavily defeated the Caledonians. Corbridge-on-Tyne is an important supply base for the Roman campaign. Severus has divided Britain into two Roman provinces. York, where he has set up court, is the capital of the Northern province called Britannia Inferior, while London is capital of Britannia Superior. 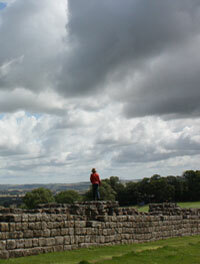 Civilian settlements called vici have evolved around Roman forts in the Hadrian's Wall area, such as Corbridge. Vici are a settlement in which craftsmen, merchants and women live. Lanchester, a Roman fort south of the Tyne, has been rebuilt and re-garrisoned by Roman troops. The fort is situated on Dere Street, an important military route into Caledonia. The Romans know Lanchester as Longovicium and there is a large civilian settlement nearby. Lanchester supersedes the nearby forts at Binchester and Ebchester which are also on Dere Street. A Roman vicus or civilian settlement has developed at Vindolanda on the Stanegate road near Hadrian's Wall. Ports on river estuaries such as the Tyne, Humber and possibly the Tees are used by Roman fleets. Many tribes have overrun Hadrian's Wall. York (Eboracum) has been heavily destroyed along with Chester (Deva) on the River Dee. 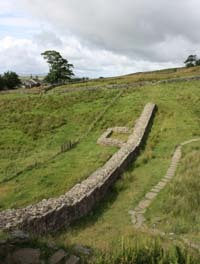 Hadrian's Wall had been left defenceless after a large portion of its garrison were removed to assist the usurping Roman gover nor Allectus in a military confrontation with Constantius, the deputy Governor of Rome. Britain has been broken into four new provinces by the Romans. Britannia Secunda, governed from York, stretches from the Mersey and Humber to Hadrian's Wall. 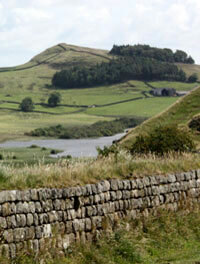 Forts have been rebuilt on both sides of Hadrian's Wall following recent destruction by unruly tribes. The Romans have rebuilt a fort and bridge on the Tees at Piercebridge. Many of the North's Roman defences are being strengthened following recent revolts. The defences will play a part in Roman campaigns against the Picts. Repair work and improvements are being carried out at York, High Rochester, Risingham, Bewcastle, Birdoswald and Houseteads on the Roman Wall. 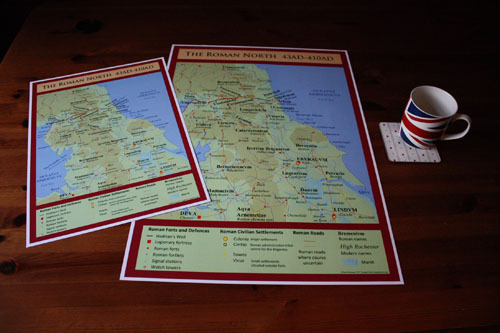 Improvements to Roman roads in the northern region will also be made.